Jason Heyward had a choice. That’s what he told Cubs.com beat writer Carrie Muskat when it was time for him to make a decision during free agency. Heyward enjoyed his time in St. Louis, but he had the freedom to go where he liked and he wanted to go to a team that would reunite him with former players who are now coaches and players he met in high school. It wasn’t like the Cardinals didn’t offer Heyward the same type of money and perks that he got when he signed for eight years and $84 million with the Cubs. He said he just finally had a choice to make his own decision. 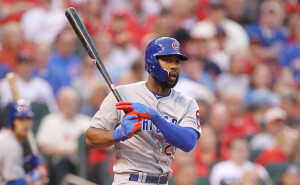 Well, Monday was the return of Heyward and the Cubs to Busch Stadium in a rematch of last year’s NLDS. 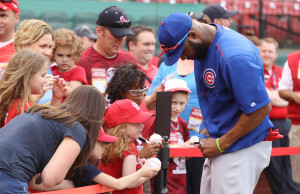 Heyward spent time before the game signing autographs for the fans, but once the game started, the fans of the Redbirds turned into boobirds. Heyward went 0-for 4 striking out looking in the first, grounding out to Aledmys Diaz to end the third, lined out to second after Dexter Fowler’s leadoff homer in the sixth and he hit the ball well in the seventh lining out to right. The Cardinals had a runner in scoring position after Yadier Molina singled and moved up to second on a wild pitch. Kolten Wong’s soft hit floated over the second basemen’s head, but Heyward, charging hard from right field made a nice sliding catch for the second out in the inning, keeping Molina at second.